Explanation: This was a sky to show the kids. 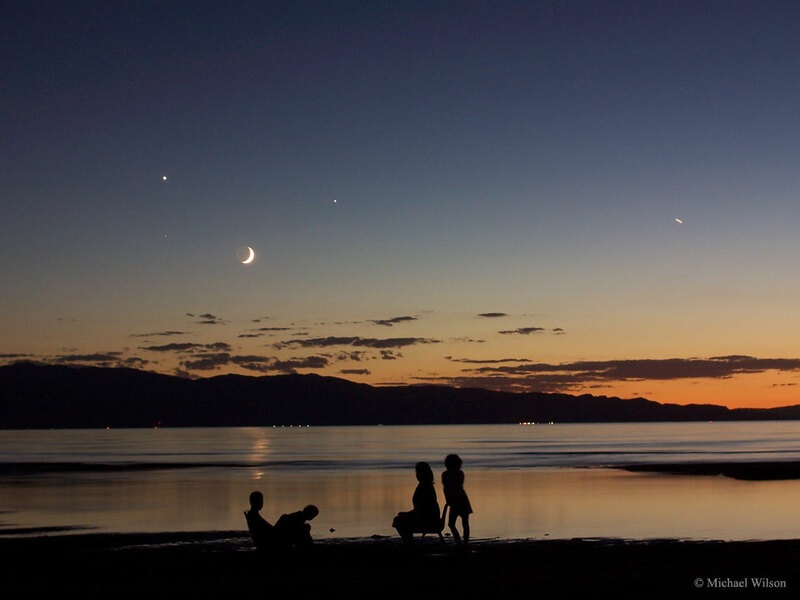 All in all, three children, three planets, the Moon, a star, an airplane and a mom were all captured in one image near Great Salt Lake in Utah, USA in early September of 2005. Minus the airplane and the quadruple on the ground, this busy quadruple coincidence sky was visible last week all over the world. The easiest object to spot is the crescent Moon, which is easily the brightest sky orb in the featured image. Venus is the highest planet in the sky, with Jupiter to its right. The bright star Spica completes the quadruple just below Venus. The streak on the far right is an airplane. Mom is seated. Grandpa, appreciating the beauty of the moment, took the picture. This week, the pre-dawn sky shows a similar conjunction of planets.